If there’s one thing you certainly can’t accuse Ramin of it's succumbing to the usual ailments of men and their ‘man flu’. He troupes on through sickness, causing dichotomous feelings for his fans – on the one hand we’re delighted that he’s there, performing for our joy and entertainment and on the other hand we’re concerned that he’s making himself worse by not getting the rest he needs. However, if you didn’t already know he was sick, there was little to give this away. He made no excuses and just got on with it. 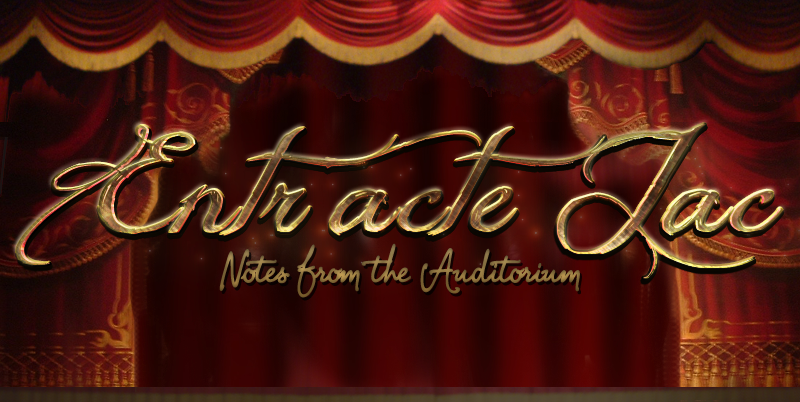 There were some tell tale signs, such as the polka dot handkerchief sticking out of his back pocket like Gertrude’s one feathered tail, occasional voice breaks and struggling to hold the note at the end of Music of the Night during the encore. For the most part he performed as perfectly as we’ve come to expect. Ramin started the show, bouncing out of the side door and, after acknowledging his audience, launched straight into the energetic ‘Show Me Light’. From there we were taken along his “Road to Find Out” – his journey from where he started to where he is now and his influences along the way. As the man himself said ‘it’s all about the journey’. We were shown his early love of rock music (‘I and Love and You’ by Avett Bros) and he related to us an anecdote about how he used to work as a pot washer in Canada and would listen to Tragically Hip on the radio. I love hearing these little anecdotes as it creates a kind of intimacy between performer and supporter – it allows us an insight outside of his life as a high profile West End performer. 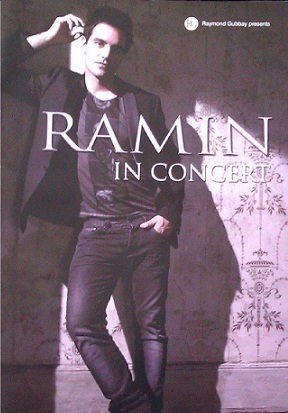 We walked down the road sign-posted ‘Musical Theatre’ – an important part of Ramin’s career and an art form that has really raised his profile. Some of the songs included ‘Bring Him Home’ (which I was most relieved was in the line up after missing his Valjean), ‘Oh, What A Beautiful Morning’ and ‘Till I Hear You Sing’ (which he forgot the lyrics to in his trademark way - but all is forgiven when you look upon his perplexed face as he tries to figure out why the next line isn’t quite coming to him). He also tried one from a musical he hasn’t been in, which I think he said was ‘Evita’ (please, correct me if I’m wrong). He had a few false starts with this one, but that’s why we love him – he just has to give a cheeky, humble smile and we all erupt into applause. He has this way of completely putting himself out there - showing us he’s just like anyone else in his tendency to make mistakes (after all, ‘to err is human’ as another artistic type wrote) and his lack of fear into approaching the unknown by performing a song that he hasn’t finely tuned and rehearsed to death. I don’t think many other performers would be so brave. Another stop on this journey was his folksy, bluegrass inspired music created for his band “Sheytoons” which he formed with good friend and fellow West End star, Hadley Fraser (who got an appreciative ‘whoop’ from the audience upon mere mention). He performed the song ‘Broken’ and ‘Lonely’ which included beautiful harmonies from Katie Birtell. All this topped off with interjections from his most recent self titled album. I was particularly looking forward to hearing him sing ‘Constant Angel’ live as this is my favourite of his own songs. Hearing it live was a moving experience as I find a lot of meaning in this song. The absolutely fabulous Carrie Fletcher. She first sang ‘A Little Fall of Rain’ with Ramin which got a roof lifting applause that lasted a good minute or so. She said on twitter later that she was inundated with people telling her she should play Eponine in Les Mis. So hopefully we'll be seeing more of her in the not too distant future. There was one other really special guest – Ramin’s son Jaiden Karimloo. He ran down the aisle to join his dad on stage. Ramin played the piano and Jaiden sang the chorus of ‘Hallelujah’. 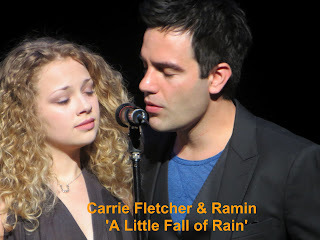 It was such a touching moment and I think even the hardest hearts would melt at the look of pride on Ramin’s face. BUT we didn’t want him to leave things there. There was a rapturous applause including..... stamping!! I haven’t heard a stamping applause in many, many years. So poor, sick Ramin came back onstage for a few more songs and I’m going to share the vid for the last encore song here, which includes some little unique moments for a Welsh audience. The clip is courtesy of @waggers1245 – follow her on twitter & youtube for lots of West End updates!! Just one more thing – I cannot end this post without mentioning the second guitarist (I guess it must be Justin Quinn, looking at the programme). His facial expressions whilst playing were brilliant. I couldn’t stop watching him. He looked so into the music, which is always nice to see. As amusing and hypnotic as this was, it was lovely to see someone with a real passion for what they do. To wrap up this somewhat lengthy blog post (which I do apologise for, if anyone has managed to make it this far – there’s just so much to say)I’ll leave you with this picture of the back page of the programme. A sentiment we should all take to heart.... and lungs. 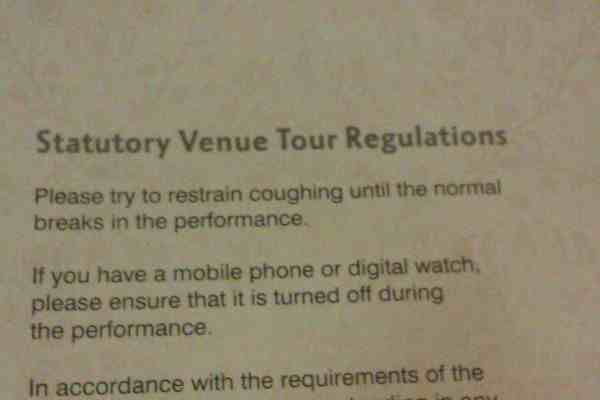 One thing I’m quite precious over is theatre etiquette! I believe in dressing smartly (and staying dressed), being quiet during the performance – that means no sweet rustling or chatting, sitting still and not fidgeting. However, I must confess that on a recent trip to the theatre I broke two of these sacred rules – I took off my shoes and made quite a fuss while trying to put my leg underneath me up on the chair. Why?! What could possibly be the reason for a self confessed theatre snob to act like such a theatre Neanderthal? Because of one small fact – I’m short. At 5ft, if I’m sat behind someone who is even average height I struggle to see. If the person in front of me is tall, my view is completely obscured bar a strip of stage on either end. Basically, pretty much wherever I sit, I’m in a restricted view seat; Particularly if the seating is barely raked. Having paid £65 for my ticket to this show, I wasn’t prepared to miss a second. So what’s the solution? It would be unfair to tall people to compromise their own enjoyment by expecting them to sit at the back all the time; It’s further away from the stage and you’re less likely to be able to pick up on nuances in expression and performance, which is one of the things many people enjoy and the reason I will pay the higher prices for my tickets. But then again, it’s unfair of tall people to expect short people to look around them just because of height, which neither of us can do anything about. When I was a child (and even smaller than I am now) I used to sit on the upturned seat to give me the height boost. 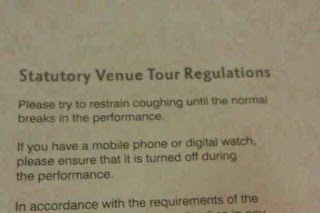 Of course, if I did this now, it would boost me too high and the theatregoers behind me would be, rightfully, outraged. They are aimed at children, of course. Which is why, perhaps, this isn’t such a good idea. The humiliation of carrying in and inflating a booster seat meant for children. It would look a bit eccentric really. Which is why I think there should be something more official provided by the theatre. Maybe made from the same (generally red, plush material) as the seating already installed which you can discreetly slide into place. Maybe they could even keep it under the seats so you don’t have to carry it in with you? I’d love to hear other peoples stories of height issues (particularly from a tall persons perspective, actually) or solutions to the problem, no matter how unrealistic.